Lost Bird’s story begins as the story of her people. She was born in the spring or summer of 1890 to a Lakota woman, part of a tribe that faced bleak times as the winter approached. Many had turned to the Spirit Dance, or Ghost Dance, for comfort, seeking solace from their ancestors. But the nearby white populations feared the dance was a precursor to rebellion and tensions mounted. The buffalo were almost gone, the cattle herds were decimated by anthrax, and the government cut rations for reservation populations. 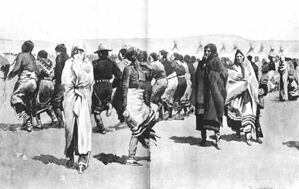 By the bitter winter of 1890, the Lakota were hungry, cold and afraid. A state-sanctioned citizen "Home Guard" began attacking Sioux encampments and hunting parties. Then Sitting Bull was murdered during a bungled arrest and a number of his followers fled the Standing Rock Reservation south to Cheyenne River Reservation. There, they joined with the people of Chief Big Foot, whose band set off toward yet another reservation: Pine Ridge. There, on Dec. 28, near Wounded Knee Creek, the group encountered the U.S. Cavalry, and set up camp. The Cavalry was joined by reinforcements from Pine Ridge. The next day, Dec. 29, 1890, the Cavalry roughly disarmed the Lakota. Someone fired a shot, and the carnage began. When it was over, hundreds lay dead. 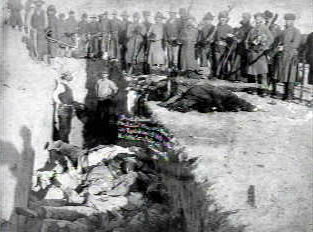 The bodies of Lakota men, women and children were scattered for miles, killed as they fled. Dozens of survivors, many wounded, were left to find help as best they could, through a day of bitter cold followed by a numbing days-long blizzard that swept across the prairie. 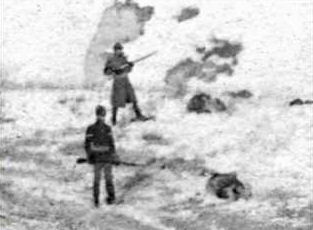 Wounded Knee’s dead were left behind, frozen to the ground. Four days after the massacre, Army parties set out to bury the dead. In addition, a Native American physician set out from Pine Ridge with his own party and his own mission - to find and help survivors. They discovered 10, and the doctor was anxious to get them to shelter. Then they heard a small cry. In a huddle of frozen women, cradled under a one woman’s body, covered in blood, was a tiny infant. She became Zintkala Nuni, the Lost Bird. Sources: "Lost Bird of Wounded Knee: Spirit of the Lakota," "Bury My Heart at Wounded Knee."